The President, in the letter personally signed by him and dated June 6, 2016, requested the Senate to approve the list at the shortest possible time. Speaking at the plenary on Wednesday, the Vice-Chairman, Senate Committee on Foreign Affairs, Shehu Sani, said his committee received “specific complaints” on the nomination affecting some states. Sani said his committee found out that career ambassadorial nominees were carefully selected on the basis of federal character, seniority, gender consideration, specialist relevance, a minimum of 30 months period of service before retirement and competence, except for a few that had between 18 and 29 months remaining period of service. The lawmaker however said officers from Bayelsa, Ebonyi, Ondo, Plateau and other states not featured on the list did not meet the conditions approved for selection. Sani added that the committee also found out that “the executive is working on the list of non-career ambassadorial nominees, which will make up for the states that were not represented in the current list. He said it was learnt that the complexities in the selection of the non-career ambassadors, whose records were not readily available for scrutiny, contributed to the submission of only the list of career ambassadorial nominees to the Senate instead of a combined list. “The list contains 12 women, which represent 35 per cent of the 47 nominees, in affirmative action on gender. 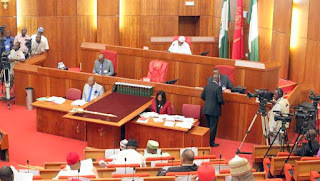 Adopting the report of the committee, the Senate approved the recommendations that the legislature should proceed with the screening and confirmation hearing of the 47 ambassadorial nominees ahead of the submission of the second list of non-career ambassadorial nominees, while the detailed screening would further address any concern that might arise. The Senate also recommended that, “The President should be advised to expedite action on the submission of the list of the non-career nominees, which is expected to balance the perceived lopsidedness in the nomination of the ambassadors. “More so, in future nominations, the executive arm should be guided to see the logic of sustaining the previous practice of presenting to the Senate a combined list of both career and non-career nominees for confirmation. “The executive arm should be equally advised to promptly commence the process of the selection of all nominees and other principal officers of government for appointments, ahead of confirmation by the Senate, to avoid delays in governmental operations. The Senate therefore considered the 47 nominees for screening and confirmation by the legislature.